Entries will be done on MileStat.com and close on Saturday February 16th at noon.Scratch deadline is Sunday at noon. 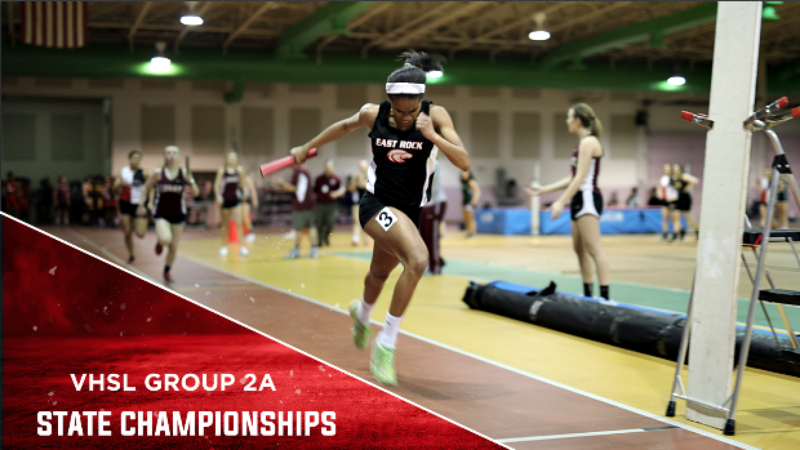 The Group 2A State Indoor Championships will be conducted at Roanoke College in Salem, Virginia on Wednesday, February 20 and Thursday, February 21, 2019. Entry Instructions: Entries will be done using Milestat.com online entry service.The site will be open until February 16 and close at noon. All entries must be submitted in FAT. (Instructions on this site) Handheld times must be converted for seeding purposes. Coaches should try to have their teams in at least one FAT timed meet. Admissions: Admission is $10.00 per day. No charge for children age 6 and under accompanied by paying adult. Accepted passes for State events include VHSCA, VHSL, VIAAA, VATA, VSBA, and Principals State Membership Cards. Coaches Meeting: 2:30 in the bullpen area. Pick up packets as you enter the track complex. Packets will have meet program, coaches' passes, and meet information. Athletes will use bib number for their ticket to leave and return to facility. Facility: The Roanoke College Cregger Center has a 200-meter track. Only 1/4 inch pyramid spikes or flats may be used. Coaches, please check athletes shoes for acceptable spikes. Rules: NFHS Track and Field Rule Book 2018 as well as the VHSL rules as stated in the VHSL handbook will be observed. Equipment: Each team must furnish its own towels, batons, and poles. Starting blocks will be furnished. Shots will be certified for competition. Each athlete must wear a proper track uniform, which shall consist of a jersey (with appropriate bib number provided by the VHSL), trunks, and shoes as identified in the current NFHS rulebook. Awards: Team trophies (1st and 2nd) will be presented at the conclusion of the meet. Individual medals (1st-6th) will be bagged and presented to coaches at the end of the meet. Scoring will be 8 places. Participation Limitations: A contestant may compete in any number of field events but shall be limited to participation in only three running events: except that a contestant who competes in the 3200m run, may compete in only one other running event on the same day as the 3200. If a contestant is entered in a field event which conflicts in the time schedule with a track event in which they are entered, they will make arrangements with the official in charge of the field event to postpone his trials until after the track event has been run. No track event will be held up to accommodate a contestant. Eligible To State Meet: Entries may be only those contestants who placed 1st, 2nd, or 3rd in their Regional Meet or those contestants who were properly reported by the conference or regional director as having met the state qualifying standards at the conference or regional meet or who met the state qualifying standard in a meet of 3 or more teams and who have been verified by the regional director.